I have a problem. When I'm using Weather2 mod. The rain sounds stops while during windy storm or normal rainfall. Can you fix this? 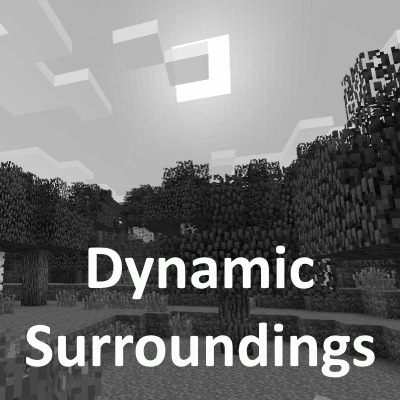 Try disabling the 'Enable Weather Control' in Dynamic Surrounding's config. That should bring back the rain sounds whenever it rains. There's a drawback with this if you do disable the option... no sandstorms, nether storms nor auroras will happen... if I recall unless that changed. Yea... I liked the Aurora appearing as well. Hello! Any way to add armor sounds to armors from other mods? I'm using Millénaire and I'd really love to have the chainmail armor sound effect (it sounds amazing) with the norman armors. Any plans on making a 1.13.2 with the forge beta? On some modpacks there was a button I could press to bring up a small volume slider for player based things like footsteps, what button is to get that gui to open? The ambience sound for the nether isn't playing on the most recent version for 1.12.2 unfortunately. I hope you plan on fixing that issue. Thank for your mod. Just to notice that the mod https://minecraft.curseforge.com/projects/better-muffling is not blocking the sound of your mod when we need to :(. Hey im having an issue when I destroy a tree it like falls over and I get all the wood and as I have biomes o plently and there is redwood forests if I cut a tree down there the massive tree falls down freezes my game for about 30 seconds then I get stacks upon stacks of woods so I feel like ive cheated is there anyway of turning this feature off? also I know 100% its got to be this mod or orelib as this only happens when I have this mod installed. Also really great mod loving it so far! Are you sure you aren't confusing this mod with Dynamic Trees?